Gajananbuwa - an upcoming handsome young vocalist and violinist. 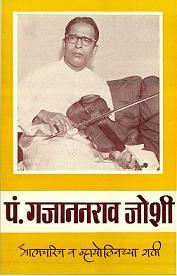 Welcome to Pandit Gajananbuwa Joshi's Official Website. 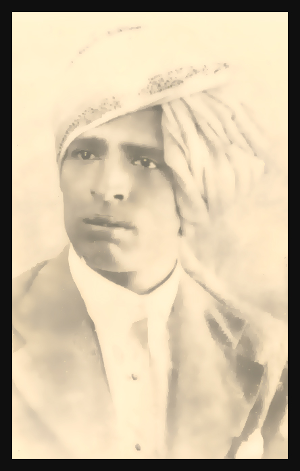 On this website you will find Gajananbuwa's contribution to the Hindustani (Indian) Classical Music. You will also be able to listen to the recordings of Buwa's live performances of his vocal and violin recitals, and listen to and learn from his one to one tutions to his disciples. We hope to give you a reasonably comprehensive information about and hopefully some insight in Buwa's life as a performing artiste, as a lifelong learner and a devotee of Music, as a Guru, as a composer of Bandishes (compositions) and as a founder of a well established and respected musical movement "Swami Shivanand Sangeet Pratishtan". Pandit Gajananbuwa was one of the most versatile musicians of his time. Indeed you could argue that he was a unique musician. He was a child prodigy. He started translating the musical configuration of notes - TANAS - in the form of notation - SARAGAMA -at a young age. Of course one could argue that Buwa's talent at a young age was not a surprise because he was the son of the Great 'Pandit Antubuwa Joshi'! He was one of the few musicians who had mastered the Gayaki of three different Gharanas (singing style of three musical traditions- schools). It is difficult enough to learn and grasp the Gayaki of one Gharana. It takes many years may be a life time to master the Gayaki of a single Gharana. Buwa however mastered the traditions of three musical schools in one life time. He was probably the only Musician of an exceptionally high standard who was both a vocalist and an instrumentalist. Indeed, he is rightly credited to have introduced the use of violin to play the Indian Classical Music. He was an undisputed grand master of LAYA - Rhythm. He was an illustrious GURU (teacher) who generously taught, trained and passed on his knowledge and Gayaki on a one to one basis to many noted musicians of today who continue the tradition of his musical style (Gayaki). It gives us a great pleasure to share with you the remarkable musical life of one of the Greatest musicians of the 20th Century.